Looking for towing services in San Diego? Look no further than Spark Towing. Spark towing is a local towing company situated in San Diego that provides a wide range of specialized towing and auto services to drivers in the area. With years of professional towing experience Spark Towing can assist you with any roadside emergency, no matter how big or how small. We work with a network of independently owned, licensed tow truck operators to ensure timely professional service. 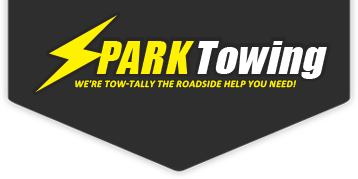 If you need fast service, Spark Towing is the right company for you. We strive to reach every call in as little time as possible (we are limited by the traffic conditions). We provide excellent professional services by our fully certified operators and our rates are very competitive. We are always happy to provide a price estimate for all services before dispatching a tow truck to your location. Spark Towing’s teams operate around the clock to ensure fast service at any time of the day or night. We also work 365 days a year. We are always available whenever you need us! Whether you need emergency towing services or you would like to schedule our services for construction equipment towing, we are always happy to discuss you needs and how we can be of assistance to you. Spark Towing works with several large construction companies so we have the experience and know-how to help you too. We understand your industry and will be happy to help you transport your heavy equipment for any of your projects. Our professional tow operators will make this part of the project less stressful for you. Spark Towing provides efficient construction equipment towing services. We have the right tow trucks and the right people for the job. Spark Towing has a variety of different tow trucks, including heavy, and medium heavy duty trucks, one ton trucks, and trailers which are used to transport different equipment. We transport construction and agriculture equipment, lumber and steel loads with our heavy hauling trucks. We also tow large vehicles. If you want your equipment to be transported safely, Spark Towing has you covered. You can be sure that your equipment is in good hands with our tow truck operators, who all have experience with hauling heavy equipment safely and making sure that it is delivered on time, according to the schedule that we agree upon with you. Let us help you get the job done properly! If you are in need of construction equipment towing in San Diego give us a call to find out our rates and discuss how Spark Towing can help your company. We hope that you’ll join our long list of satisfied customers!